Food for themed get-togethers rarely causes a problem for a host or hostess, though dessert can occasionally be a challenge. It would be a bit ludicrous to serve flan with football fare, so over the years I've found or developed recipes a bit more fitting for these informal gatherings. My dessert plans for our Southwestern-style Super Bowl gathering, include a moist fudge-type brownie made with Mexican chocolate and ground chiles, and a homemade dulce de leche ice cream that I'll serve with a salted caramel sauce. I'll save the recipe for the ice cream for another day and just concentrate on the brownies tonight. Mexican chocolate can be difficult to find, so rather than rely on the vagaries of the market place, I use a recipe whose ingredients create a reasonable facsimile of the real deal. 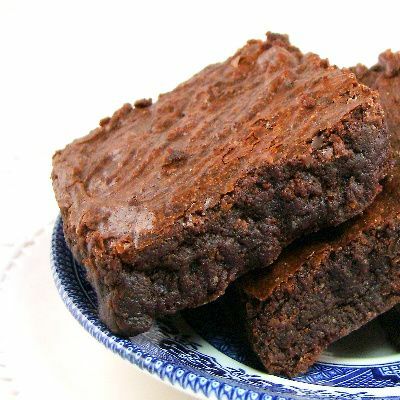 I think most of you would agree that brownies are among the easiest desserts that can be made. This one is no exception. My recipe for Mexican chocolate brownies is inspired by one that appeared in Gourmet magazine over 15 years ago. While it is not my favorite brownie, it is my favorite for Mexican or Southwestern themed events. I've simplified the original recipe by using store-bought almond meal, and I have added a small amount of ground chili to give the brownies an authentic flavor punch. The chocolate-chili combination is not unusual in Mexican desserts and the flavors work well together. Do not use your standard chili powder to make these brownies. It contains cumin and other additives that don't work well with the chocolate. If you cannot find a New Mexico or an Ancho chili powder, a very small amount of cayenne pepper can be substituted. These brownies are dense and moist and almost like a confection. I think they are deliciously different. I hope you will too. Here's the recipe. 1) Preheat oven to 350 degrees F. Butter and flour a 9-inch square baking pan, knocking out excess flour. Set aside. 2) In a heavy 1-1/2-quart saucepan melt butter and chocolate over low heat, stirring, until smooth. Remove pan from heat and let chocolate cool for 10 minutes. 3) Combine almond meal and sugar in bowl of a food processor and pulse to combine. Stir mixture into chocolate mixture. Add eggs, one at a time, beating well with a wooden spoon until mixture is smooth and glossy. Stir in flour, salt, cinnamon and chili powder until just combined. 4) Spread batter evenly in pan and bake in middle of oven 25 to 30 minutes, or until a tester comes out with crumbs adhering to it. Cool brownies completely in pan on a rack before cutting into 16 squares. Brownies keep, layered between sheets of wax paper in an airtight container at cool room temperature. Yield: 16 brownies.